Picture from Homerclesse : Views to Mullaghcleevaun and Coronation Plantation from Athdown Brook. Picture: Views to Mullaghcleevaun and Coronation Plantation from Athdown Brook. I have tackled this summit a number of times from a couple of approaches. My favourite is to park at the gates of the Kippure Estate and follow the track across the road. This eventually leads into heavy forest with a lot of deeply rutted tracks and felled trees. The best option is to head to the river bank (Athdown Brook) and climb up along the left side bank of it. A nice view behind you to the Coronation Plantation and the Mullaghcleevaun Range. Once you clear the line of trees on the left then it's simply a matter of heading a little north of west to the summit Seefin. A very interesting Cairn awaits and will be your heading in clear weather. 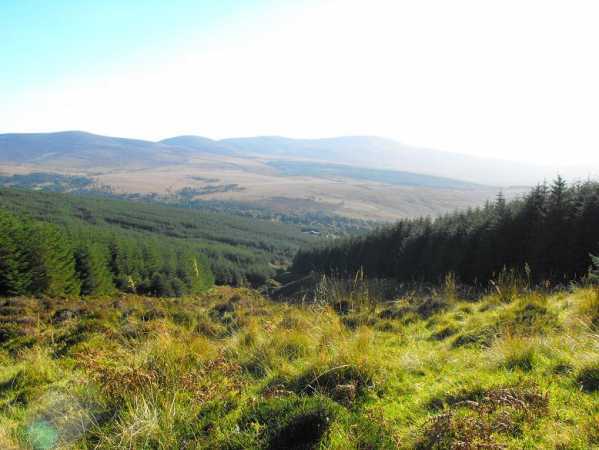 Great views of the Blessington Lakes, the other hills of the West Wicklow range, south to Mullaghcleevaun and east to Kippure and Sugar Loaf. An alternative route is to park on the west side of Seefin at the gates and go straight up the Forest track.